Kindle Owners’ Lending Library Hits 100K Milestone; Can It Continue? Amazon’s controversial Kindle Owners’ Lending Library has proven to be a hit among readers and an appealing option for many self-publishers, but there still remains some question as to how successful it can hope to be as an ongoing project. The basic organization is simple. 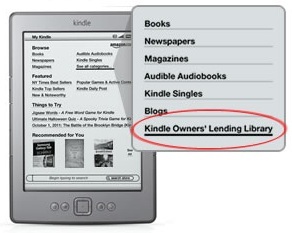 Authors who are willing to make their work available exclusively through the Kindle Store will find themselves with the option to allow lending through the library. When included, they get a certain share of the money pool being filled in each month by Amazon to keep the service going. The more popular a book is among borrowers, the larger the share of that pool that goes to the contributing author. For many self publishers who find they make the majority of their income through the Kindle anyway, going exclusive is not really a big deal in terms of income alteration. The worst that can happen is that nobody borrows the book, and even then it doesn’t cost anything significant. Leaving aside the philosophical issues in choosing to contribute to Amazon’s ever-growing list of exclusive content, which is an interesting and complex subject for debate that will probably come up again at greater length in its own post to better do it justice, as the number of participating authors grows we may see a drop in interest among new potential contributors. The restrictions regarding access to the library play a fairly large part in this. Each borrower must own a Kindle eReader or Kindle Fire, be an active Amazon Prime member, and remember to make use of their one monthly rental each time around if an author is to get anything. This is a very specific audience to be targeting with your marketing and may prove to be somewhat hard to pin down. Add into this the fact that, while the number of Kindle Editions now available through the library has grown past 100,000 titles, the amount of money being competed over has not been increased in any ongoing way and you have a complicated decision presented to self publishers. A highly limited number of readers needs to be enticed to choose your book from an increasingly large pool of options in an environment where the reward for each individual choice is likely to count for less due to the pre-determined maximum award size and ever-increasing number of Kindle owners. Can Amazon hope to keep the Kindle Owners’ Lending Library growing at a decent pace? Chances are good that they can. Will it continue to be a persuasive reason for new authors to agree to exclusivity? That might be harder to keep up. As numbers come out and we learn at least enough about the big success stories to determine how little of the cash pool was available for other authors to divvy up, we should be able to get a clearer picture of how well somebody can expect to do through this program, After all, even if you were only making $1 per book sold on each of your hypothetical 30 annual sales through Barnes & Noble, that’s better than getting nothing at all from a lending library for Kindle owners. A clearer picture should emerge as more time passes, but without a new source of big name titles or an increase in funding, Amazon’s Kindle Edition lending effort seems like it might have a limited shelf life.